Is cervical instability the cause of lumbar canal stenosis? Aim: On the basis of an experience with 12 cases, the validity and rationale of cervical spinal stabilization for cases having both cervical and lumbar spinal canal stenosis is analyzed. Materials and Methods: From March 2017 to May 2018, 12 patients presented with a major symptom of neurogenic claudication pain generally related to lumbar canal stenosis in addition to other symptoms related to cervical myelopathy. The average age was 57 years. All patients were clinically and radiologically diagnosed to have both cervical and lumbar spinal canal stenosis. Based on the concept that degenerative spinal spondylotic myelopathy is an outcome of spinal instability, all patients underwent cervical spinal stabilization. No decompression by bone resection was done. The lumbar spine was not surgically treated. Visual analog scale, the Japanese Orthopaedic Association, and Oswestry Disability Index were used to monitor patients before and after surgery. Results: There was dramatic relief from symptoms related both to cervical and to lumbar canal stenosis in the postoperative period. During the average period of follow-up of 12 months, none of the patients have experienced recurrence of lumbar pain or needed any surgery. Conclusion: The report highlights the possibility of recovery in lumbar canal stenosis related symptoms following cervical spinal stabilization surgery for associated cervical spinal stenosis. We conclude that in select cases, cervical spinal instability may be the cause of clinical and radiological observations in cases having lumbar canal stenosis. We report our clinical observation in cases having concurrent cervical and lumbar spinal canal stenosis. Such coexisting lumbar and cervical canal stenosis are sometimes referred to as “tandem spinal stenosis.”. The symptoms related to lumbar canal stenosis were prominent in the presenting clinical profile. Following treatment of cervical spondylotic disease that involved only spinal fixation and no direct or indirect bone decompression, there was dramatic and lasting relief from symptoms related both to cervical and lumbar canal stenosis. We analyze our novel form of surgical treatment of cervical spondylotic myelopathy and the probable causes of relief from symptoms. From March 2017 to May 2018, 12 patients were identified who presented with lumbar neurogenic claudication as one of their major clinical symptoms. The case analysis is based on a retrospective review of clinical data. The follow-up period ranged from 6 to 16 months (average 12 months). All the patients provided written informed consent before surgery, and all clinical tests and surgical procedures were conducted according to principles of the Declaration of Helsinki. There were nine males and two females. The ages of the patients ranged from 44 to 71 years (average 57 years). All patients had classically described symptoms that are attributed to lumbar canal stenosis that include claudication pain in the low back and radiation along the posterior aspect of the legs. In addition, they had symptoms of paraesthesia and weakness in hands and fingers. Ten patients had stiffness in the legs. The symptoms are summarized in [Table 1]. As per our protocol, all patients underwent dynamic (flexion and extension) plain radiographs and computed tomography scan and magnetic resonance imaging of the cervical and lumbar spine. The radiological features are summarized in [Table 2]. All patients underwent treatment for cervical spinal stenosis by “only-fixation” of involved spinal segments.,, The transarticular technique of spinal fixation was used as described by Camille and Saillant in 1972. The levels of spinal fixation depended on clinical and radiological imaging and additionally by manual manipulation and direct observation of the status of facetal articulation. The patients were operated in prone surgical position. After a midline incision, wide exposure of the affected facets as indicated by the radiological and clinical information was done. In addition, adjoining facets were exposed. Although the clinical symptoms and radiological information were suggestive, direct physical observation and manual manipulation of the facets finally determined the levels of spinal fixation that was carried out. The observation of open articular cavity, osteophytes in the vicinity of facets, excessive or abnormal mobility of the facets on manipulation were the indicators that suggested the level of spinal fixation that was indicated and conducted. No bone or soft tissue removal to affect decompression of the dural tube or the traversing neural structures was carried out. The spinous process was cut sharply at the base, and the bone obtained was shredded and was used as a graft material. Following screw implantation, all inter-spinal ligaments were widely resected, bone of the lamina and the screw adjoining surface of the facets were decorticated to make the environment suitable as the host bone for grafting. Apart from bone graft obtained from spinous process, iliac crest bone graft was used in eight patients, where levels of fixation were of three or more cervical spinal segments. The patients were mobilized as soon as this was possible but were advised external cervical arthrodesis and restricted activities for 6 weeks. The patients were then advised normal physical activity after confirmation of the status of screws. Postoperative imaging was done in the immediate postoperative phase and at follow-up examination [Figure 1]. The follow-up ranged from 6 to 18 months (average 12 months). Independent observers who are not the authors of the present article did clinical assessment and radiological interpretations. All patients improved in their symptoms related to both lumbar and cervical spinal stenosis in the immediate postoperative period. Visual analog scale, the Japanese Orthopaedic Association, and Oswestry Disability Index scales were compared both before and after surgery. During the follow-up, there was no recurrence of symptom in any case [Table 3], [Table 4], [Table 5]. Successful segmental arthrodesis was achieved in all cases. All patients were satisfied with the clinical outcome and are professionally active. In none of the cases was the operation repeated or any additional surgical maneuver was done on the cervical or at lumbar spinal level. Lumbar canal stenosis is one of the more frequently identified spinal ailments in aging population group. The common presenting symptom is neurogenic claudication pain. Radicular tingling and numbness, paraesthesia and weakness are other common symptoms. The symptoms are activity related and are initiated on walking or prolonged standing. Rest pain is a terminal outcome of longstanding and untreated lumbar canal stenosis. The simultaneous presence of cervical and lumbar spinal stenosis is a relatively frequently observed the clinical phenomenon. Lee et al. identified radiologically and detected the presence of moderate-to-severe cervical spinal canal stenosis in approximately 25% of patients having lumbar canal stenosis., Yamada et al. identified in their large series of cases that approximately 15% of cases with lumbar canal stenosis needed surgery for cervical spinal canal stenosis. The generally identified symptom complex in such cases includes claudication pain in the legs, mixed upper and lower extremities symptoms and signs, and progressive gait disturbances. 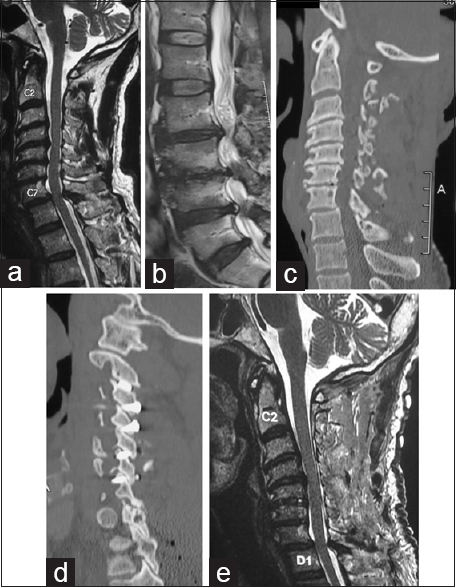 In the year 2011, for the first time in the literature, we identified that vertical spinal instability manifested by facetal overriding or telescoping is the nodal point of pathogenesis of degenerative spinal disease both in the cervical and lumbar spine., “Life-long” standing human position and related stress on the paraspinal muscles, and their disuse or misuse and injury is probably the cause of their failure to sustain prolonged stress of standing position or walking. Standing human position, aging muscles, heavy body weight, and sedentary lifestyle may have a contributory effect on the pathogenesis of entire spectrum of spondylosis or degeneration of the spine that eventually leads to both cervical and lumbar canal stenosis. Considering this fact, the spinal alterations in such cases are usually observed in more than one spinal segment and frequently involve both cervical and lumbar spinal levels. The classically described symptom of claudication pain in lumbar canal stenosis is probably related to early muscle fatigue on walking for a distance when they give way and allow facetal overriding and listhesis. The fact that the symptoms of backache radiating to the legs and paraesthesia are initiated on walking for a distance indicates that there is no inherent canal stenosis or neural compression at rest. It also indicates the dynamic nature of the entire process and the role of vertical spinal instability. Although the symptoms related to single or multilevel cervical spondylosis are generally independent of activity, instability seems to be the nodal point of pathogenesis of the entire cascade of degeneration. For the treatment of both cervical and lumbar spinal single or multilevel degeneration, we identified the therapeutic role of interfacetal distraction using “Goel facet spacers” in distraction-stabilization that ultimately lead to arthrodesis of the spinal segments.,,, It was observed that distraction of the facets lead to unbuckling of the ligamentum flavum and other interspinal ligaments and increases the spinal, neural canal and intervertebral body dimensions. Essentially, distraction assists in reversal of all the radiologically observed pathological alterations generally associated with spinal degeneration. For the first time in the literature, it was suggested that decompression of the neural structures by bone removal was not advocated as a form of surgical treatment. We identified 12 patients whose major presenting symptom was characteristic neurogenic claudication pain that was prominently in the low back and radiated in the posterior aspect of the thigh into one or both legs. There were radicular paraesthesia of tingling and numbness (10 patients) and motor weakness (5 patients). In addition, the patients complained of symptoms of tingling and numbness and weakness in the figures and hands. Ten patients identified stiffness in the legs. Neurological examination identified the presence of spasticity in the legs and brisk tendon jerks in 10 patients. Essentially, there was a mixed presentation of both upper motor and lower motor neuron signs in the legs. The radiological examination showed clear evidence of multilevel neural compression indicative of both cervical and lumbar canal stenosis. In cases with tandem spinal degeneration, several authors recommend a staged surgical procedure in such a situation, cervical spine taking a priority in surgical management. The severity of symptoms related either to lumbar or to cervical canal stenosis has been a parameter for some to decide if cervical or lumbar surgery should be done first. Several other groups prefer decompressive operations on both the cervical and lumbar spines simultaneously under the same anesthesia. The advocates for cervical first surgery observe that the decompression of the neural tracts in the cervical spine that subsequently travel through the lumbar canal can result in relief from symptoms related to lumbar spinal canal stenosis., Failure to recognize the presence of cervical spinal stenosis in cases with lumbar canal stenosis has been identified to carry risk of cord injury during positioning for surgery for lumbar canal stenosis. As per our defined and previously published protocol, only spinal fixation using transarticular technique was deployed for surgery on the cervical spine.,, No decompression by bone or ligamentous resection was done. The levels of spinal fixation were determined by considering both radiological and clinical parameters in addition to direct observation of facetal instability. Complete amelioration of symptoms attributed to lumbar canal stenosis in the immediate postoperative phase was a surprise but a consistent observation. The general observation is that the duration of clinical symptoms related to lumbar canal stenosis has an impact on the extent and duration of recovery. In all our cases, irrespective of influencing parameters, the recovery was in the postoperative phase after reversal from anesthesia. Although the relief from claudication pain could be determined only on walking for a distance, the patients were relieved of nagging pain in the back in the immediate postoperative period. The relief from symptoms related to lumbar canal stenosis was quick and lasting; indicating that the radiological alterations in the lumbar spine and clinical symptoms related to lumbar canal stenosis had a direct relationship with cervical spinal instability. Our earlier observation was that in the event of chronic atlantoaxial instability, natural protective prolonged neck muscle spasm could lead to shortening of neck size, torticollis, secondary cervical spinal spondylotic changes and a range of other musculoskeletal abnormalities. It was observed that atlantoaxial stabilization initiated a process of reversal of several secondary alterations. The neck length increased and torticollis reversed to normalcy, sometimes in the immediate postoperative period. These observations of the relationship of atlantoaxial instability with cervical spinal musculoskeletal alterations were correlated with the presented scenario where cervical spinal instability was associated with symptoms of lumbar canal stenosis. In the presence of cervical spinal instability, spasticity in the muscles of the legs and back seemed to influence presence of clinical and radiological features of lumbar canal stenosis. Moreover, the classical neurogenic claudication pain symptom was observed even in the presence of spasticity of the legs. Although reversal of radiological features was not demonstrated on follow-up assessment, complete relief from symptoms related to lumbar canal stenosis was a definite observation. On an average follow-up of 12 months, direct lumbar surgery could be avoided in all the cases. The relatively small number of treated cases is the drawback of the study. Moreover, no comparative analysis was available with other forms of treatment of cervical spondylosis. Considering the clinical implications of our results, a large patient cohort in a number of surgical centers is necessary to identify conclusive treatment protocol. In cases with tandem spinal degeneration, surgical treatment of cervical spinal degeneration can result in amelioration of all symptoms related both to cervical and to the lumbar spine. Lumbar spine surgery can be avoided in such cases. Goel A. Only fixation for lumbar canal stenosis: Report of an experience with seven cases. J Craniovertebr Junction Spine 2014;5:15-9. Goel A, Goel AA, Satoskar SR, Mehta PH. Double insurance transfacetal screws for lumbar spinal stabilization. J Craniovertebr Junction Spine 2014;5:85-7. Roy-Camille R, Saillant G. Surgery of the cervical spine 2. Dislocation. Fracture of the articular processes. Nouv Presse Med 1972;1:2484-5. Lee SH, Kim KT, Suk KS, Lee JH, Shin JH, So DH, et al. Asymptomatic cervical cord compression in lumbar spinal stenosis patients: A whole spine magnetic resonance imaging study. Spine (Phila Pa 1976) 2010;35:2057-63. Yamada T, Yoshii T, Yamamoto N, Hirai T, Inose H, Okawa A, et al. Surgical outcomes for lumbar spinal canal stenosis with coexisting cervical stenosis (tandem spinal stenosis): A retrospective analysis of 565 cases. J Orthop Surg Res 2018;13:60. Goel A. Not neural deformation or compression but instability is the cause of symptoms in degenerative spinal disease. J Craniovertebr Junction Spine 2014;5:141-2. Goel A. Letter: Lumbar fusion for degenerative disease: A systematic review and meta-analysis. Neurosurgery 2017;81:E64-5. Goel A. Is the symptom of cervical or lumbar radiculopathy an evidence of spinal instability? J Craniovertebr Junction Spine 2018;9:81-2. Goel A, Dharurkar P, Shah A, Gore S, More S, Ranjan S. Only spinal fixation as treatment of prolapsed cervical intervertebral disc in patients presenting with myelopathy. J Craniovertebr Junction Spine 2017;8:305-10. Goel A, Dharurkar P, Shah A, Gore S, Bakale N, Vaja T. Facetal fixation arthrodesis as treatment of cervical radiculopathy. World Neurosurg 2019;121:e875-81. Krishnan A, Dave BR, Kambar AK, Ram H. Coexisting lumbar and cervical stenosis (tandem spinal stenosis): An infrequent presentation. Retrospective analysis of single-stage surgery (53 cases). Eur Spine J 2014;23:64-73. Naderi S, Mertol T. Simultaneous cervical and lumbar surgery for combined symptomatic cervical and lumbar spinal stenoses. J Spinal Disord Tech 2002;15:229-31. Felbaum DR, Fayed I, Stewart JJ, Sandhu FA. Relief of lumbar symptoms after cervical decompression in patients with tandem spinal stenosis presenting with primarily lumbar pain. Cureus 2016;8:e940. Goel A, Shah A. Reversal of longstanding musculoskeletal changes in basilar invagination after surgical decompression and stabilization. J Neurosurg Spine 2009;10:220-7.